Khan Tunic at San Diego Comic Con and Prop Store items. 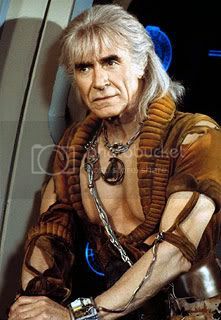 The second Khan costume in 4 months has hit the market and it is the iconic (A term very over-used by a certain person) version from which Ricardo Montalban showed off his very real pecs! Certainly this is the most desirable villain costume from the Star Trek movies and since Star trek II is one of the best science fiction movies of all time, the costume is the a legitimate Holy Grail for any Star Trek collector. This is NOT the costume that was previously sold by Profiles in History at the Bob Justman Auction in 2002. That costume sold for $ 25,000 or so (don't have the exact # unfortunately), but also had boots, his necklace and the bandolier type piece that you see across his chest. 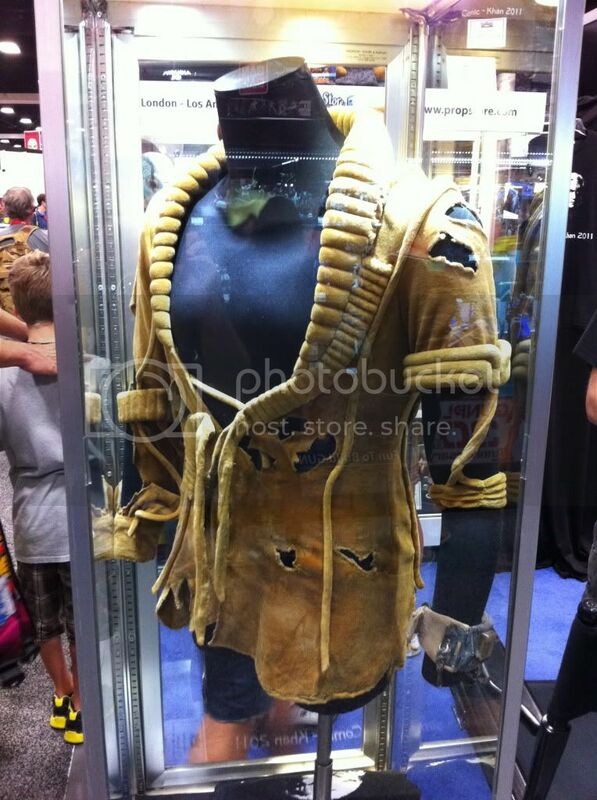 This costume, being sold 9 years later, has a price tag of $ 35,000. Now, the Khan "reveal" wrap and visor display that was sold at Profiles in April originally sold at the Bob Justman auction in 2002. It sold then for $ 25,000 . It sold for $ 32,500 at profiles in April, which was the opening bid and the bottom range of the estimate. If someone has specifics on either of these, please let me know. So is this Star Trek costume priced right? I think so. This is certainly more desirable than the visor/wrap. And while this is not as complete as the one sold at the Bob Justman auction, it is still probably the most desirable non-TOS costume out there, with the exception of maybe Kirk's ST II:TWOK Maroon. And we know that went for $ 37,500 at Heritage last Fall. (But probably an aberration since I was the under-bidder and absolutely deluded to bid that much. I blame my friend Jack for egging me on!). 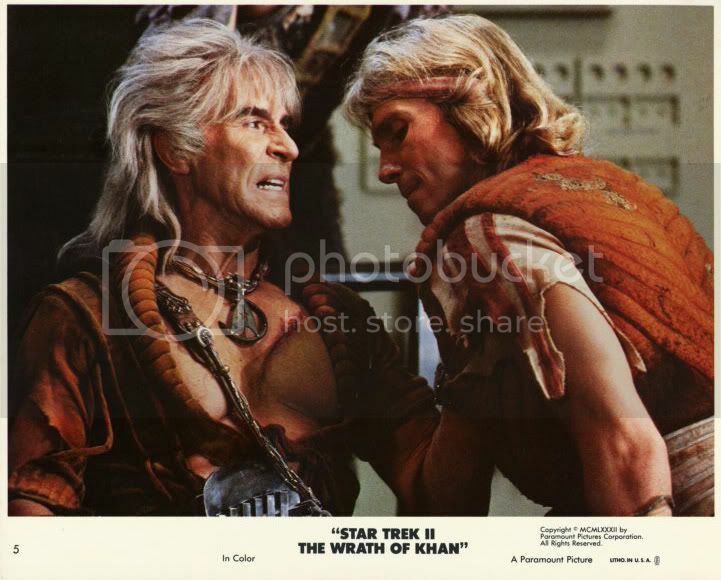 If the more complete Khan from the Bob Justman auction were to hit the market, it would probably be a $ 40-50,000 costume. So $ 35,000 for a less complete one would make sense. It will be interesting to see if the Khan piece sells. The two other big pieces from the collection that Prop Store was consigned, The Finnegan costume and the Uhura uniform mini-dress, have both sold already in private sales. 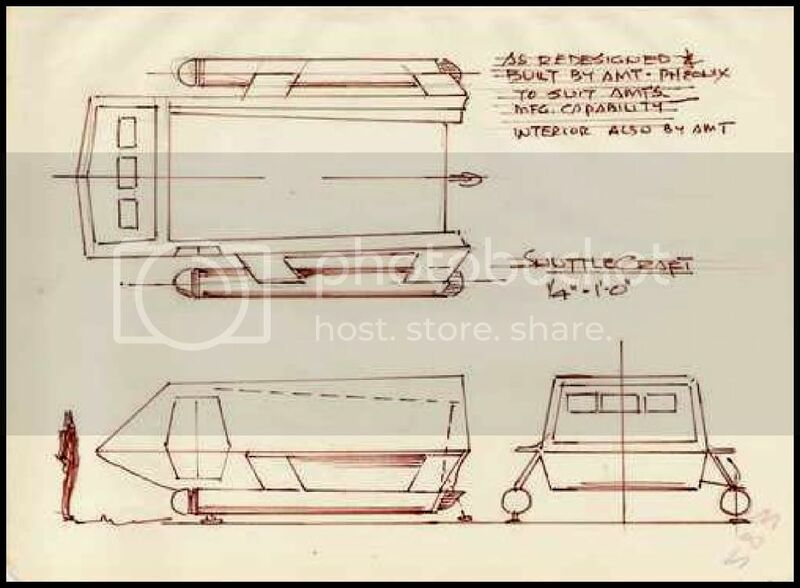 The final design of the Shuttlecraft shows a sleek craft that does not allow occupants the headroom to stand up fully (unless you’re under 5-1/2 feet tall). 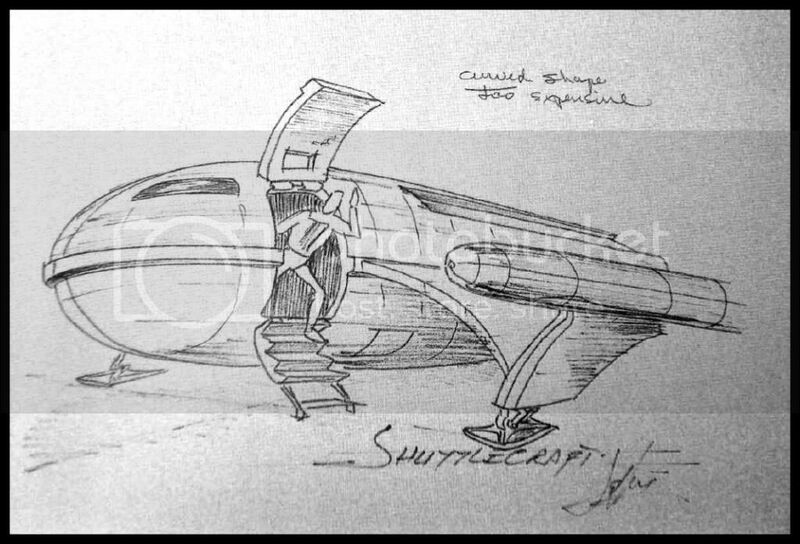 This was intentional as the shuttle was intended to be a compact vehicle, kind of like a mini-van. However, for “The Galileo Seven” episode, it was elected to build (also by AMT) a stand-up interior for best dramatic effect. The rear compartment is larger and even included a magical second hatch not seen on the exterior! 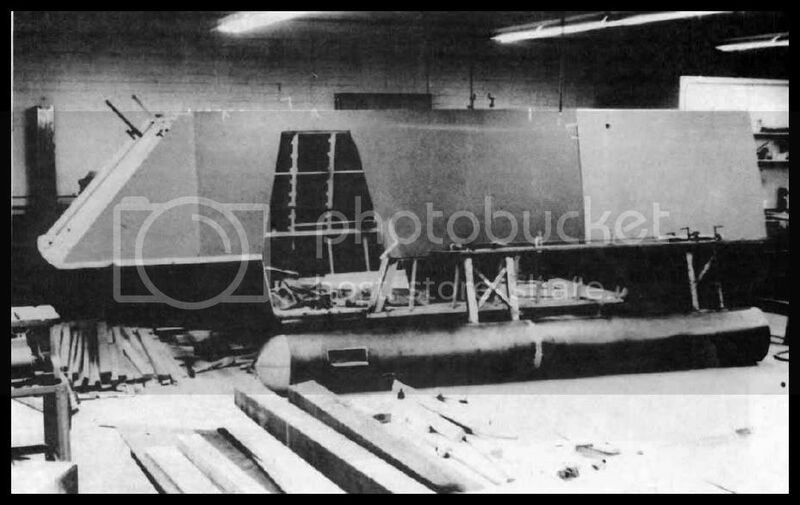 Compare these screencaps with Leonard Nimoy (6’-1”) inside the interior shuttle set, and Mark Leonard (6’) outside the door of the mock-up. 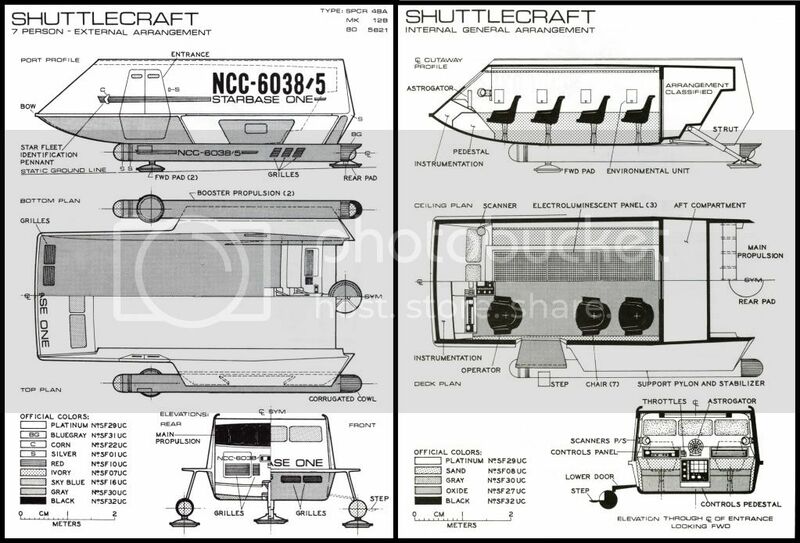 These are the drawings of the finished shuttle by Franz Joseph (Schnaubelt), of the infamous “Star Fleet Technical Manual” and “Constitution Class Blueprints. The Galileo model kit actually came out in 1974, 5 years after Star Trek was cancelled! The entire line of “Star Trek” models would prove to be very profitable for AMT! In the series, the Galileo was “destroyed” in “The Galileo Seven” episode, but returned in “The Doomsday Machine” (#35-presumably), “Metamorphosis” (#38), “Journey to Babel (#39) and “Immunity Syndrome” (#47- where it was destroyed again). It appeared as the “Galileo II” in the third season episode “Way to Eden” (#75). It was easier and inexpensive to paint “II” on the mock up than re-letter a new name and designation; but because of the continuity overlook of its second destruction, it should have been “Galileo II” in “Metamorphosis” and “Galileo III” in “Way to Eden”. After 3 seasons, Star Trek was canceled in 1969. Paramount donated the shuttle mock up to “The Braille Institute” in Los Angeles, where it was used as a plaything for the young students. However, because of safety concerns, they sold it to Roger Hiseman of Palos Verdes, who wanted it for his older son. 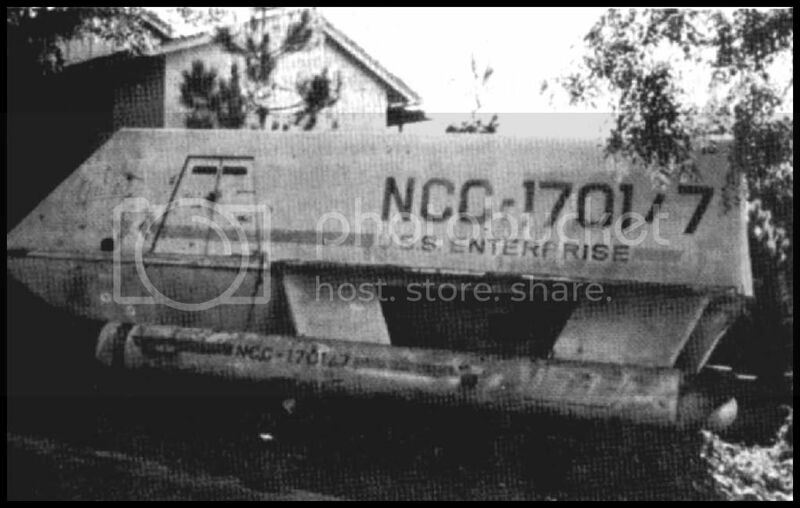 For whatever the reason, Mr. Hiseman kept the shuttle in his front yard, where it was considered an eyesore by his neighbors. They petitioned that it be removed, and luckily for the owner, a man named Stephen Haskins bought the shuttle from him. Mr. Haskins paid about $8500 to restore the Galileo and in 1986, it was unveiled and displayed at the California “Creation” Convention celebrating the 20th anniversary of “Star Trek”. When not on display, the Galileo was stored in the open (! ), uncovered and exposed to the elements. She was restored twice more, but ultimately left to ruin, physical damage and at some point, it was even filled with sand! Here she rots amongst old RVs and busses in California. 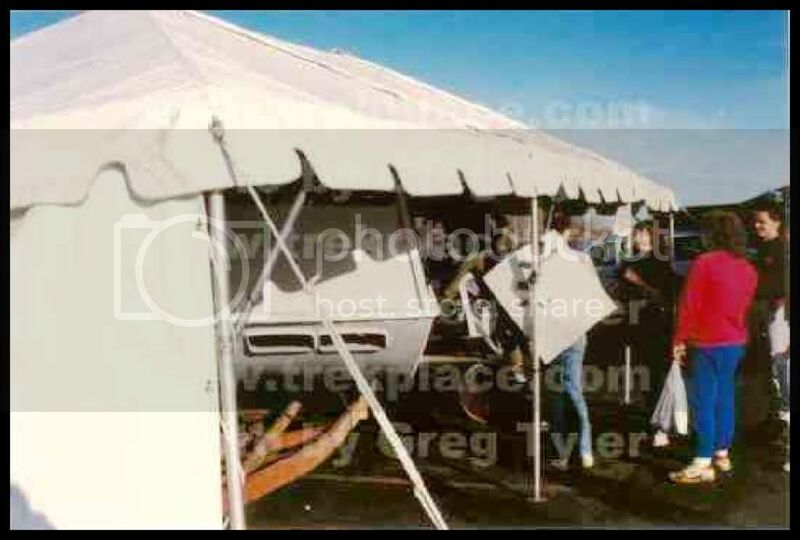 Commemorative t-shirts were sold to raise funds, and con attendees could see the Galileo and the beginnings of her restoration under a tent outside of the con hotel. Members of her restoration team included Tim Gillespie and William “Buck” Krause. They along with Lynne are members of the USS Lagrange. Here’s a video put together by the “Galileo Restoration” team, documenting her condition before her transport to Ohio, and showing the start of her restoration. 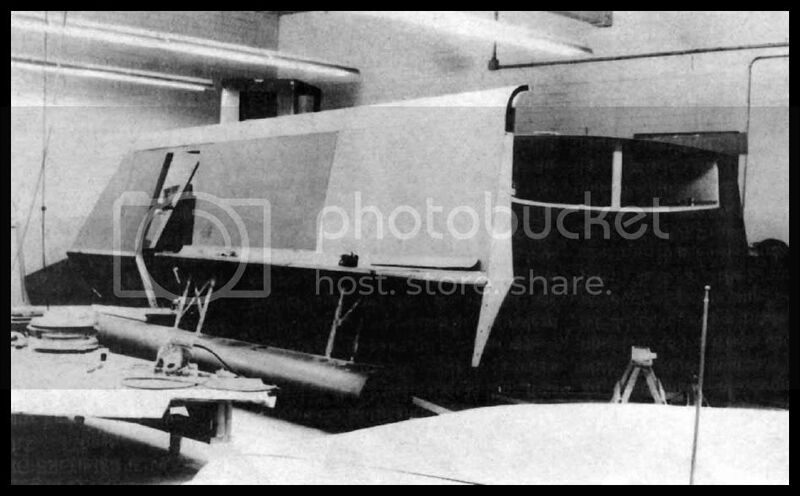 Here are pictures of the Galileo kept and worked on in a hangar at the Akron-Canton Airport in 1992. 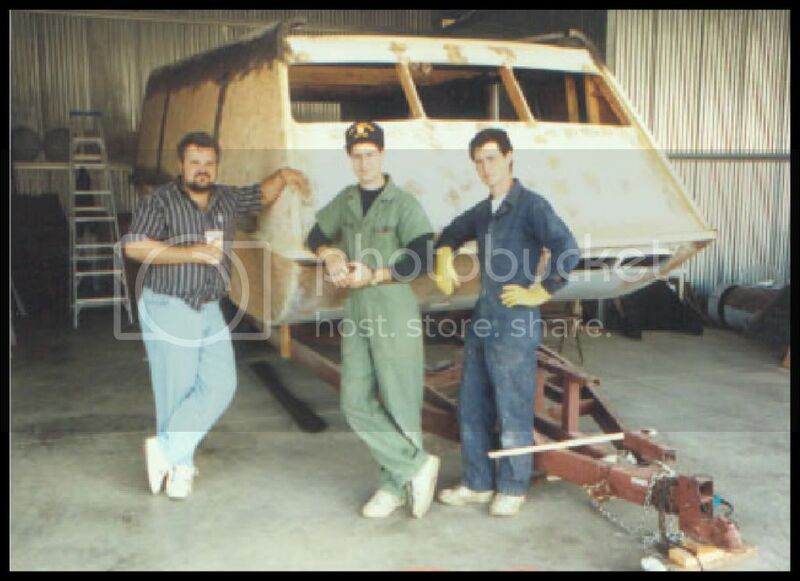 The 2nd pic shows prop-maker Ed Miarecki (l) visiting with restoration team members Buck Krause (c) and Tim Homa (r). “The woman who owned it had it moved to a sand blasting company in Akron, Ohio. She wanted to have some work done on it but eventually it became clear to the owner of the company that she was not coming back, they never heard from her again and could not reach her via the phone number she left with them. 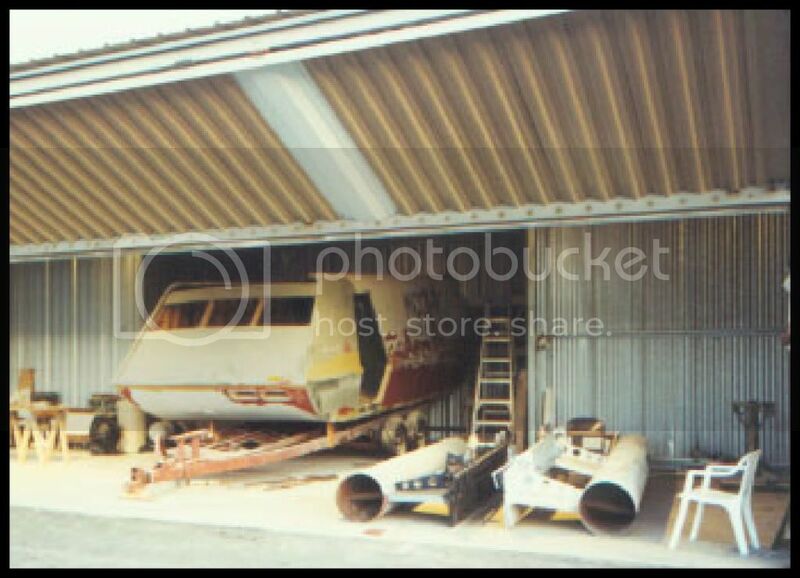 The mock up sat in their storage yard for over 5 years with no one coming forward to claim it. Finally, I was contacted by a local fan who stumbled across it by accident when he went to that company and who suggested that it needed to be "rescued". Well, he was right but there were so many issues and costs involved that I could not see any practical way to do it. With this discovery, I contacted Tim Gillespie of the restoration team and who lived near the yard, to try to find out more. Tim went out to the yard, and verified that it was no longer there. I’m hoping it may have been taken by someone who recognized what it was, or possibly that it was reclaimed by the owner. Attempts to date to find the owner have failed. At this point I believe once the owner is found, she will be able to reveal if she still has it, sold it, or if it was abandoned and left for trash. I and many others hope it wasn’t trashed. Recently, on Doug Drexler’s blog “Drexfiles”, Tim Gillespie posted the following in response to a poster who suggested her restoration was “mishandled” by the “USS LaGrange” club. He also supplies details about how the restoration team and owner Lynne Miller parted ways. 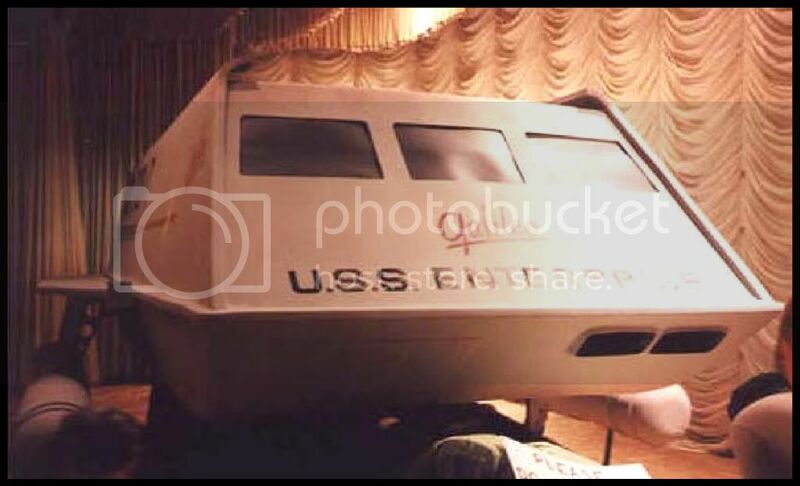 This may be a bit late but I want to clarify something concerning the USS Lagrange and the restoration of the Galileo Shuttlecraft. The Galileo was the sole property of Lynne Miller. Although some chapter members assisted Lynne from time to time and two of our members were handling the actual restoration, all the decisions regarding the shuttle were in the hands of Lynne. As club president at the time (and knowing Lynne as I did), I insisted that anything regarding the shuttle was done purely at Lynne’s discretion and not as an “official” Lagrange project. Lynne was a very difficult person to deal with and when the inevitable problems arose (and they did) I didn’t want any fingers pointed at the chapter. To suggest that the Lagrange “mishandled” the Galileo is completely wrong. We neither owned it nor did we make any decisions regarding it. Whatever happened to the Galileo was completely the responsibility of Lynne Miller. Personally, I haven’t seen Lynne Miller since 1998 when I left Trek fandom for good. If I had to guess, the Galileo no longer exists or it is in such disrepair that it is no longer salvageable. It was not something you could move around easily and required constant upkeep. 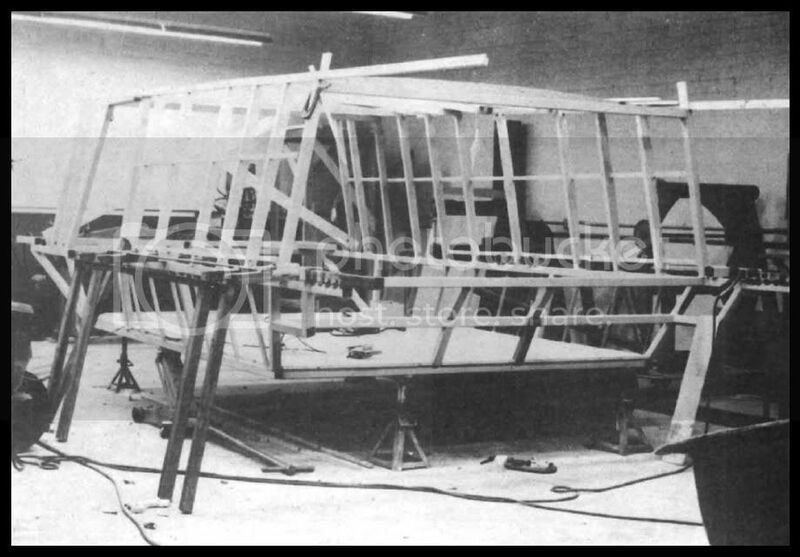 Bill and Tom, when they gave up the project due to problems with Lynne, had completed most of the restoration of the main hull. Bill Krause is probably one of the most talented and meticulous people you could ever hope to meet and I assure you what they did with the restoration was first class. However, if this thing has been hauled around from location to location and left outside for any length of time without proper storage, it’s just not going to hold up. 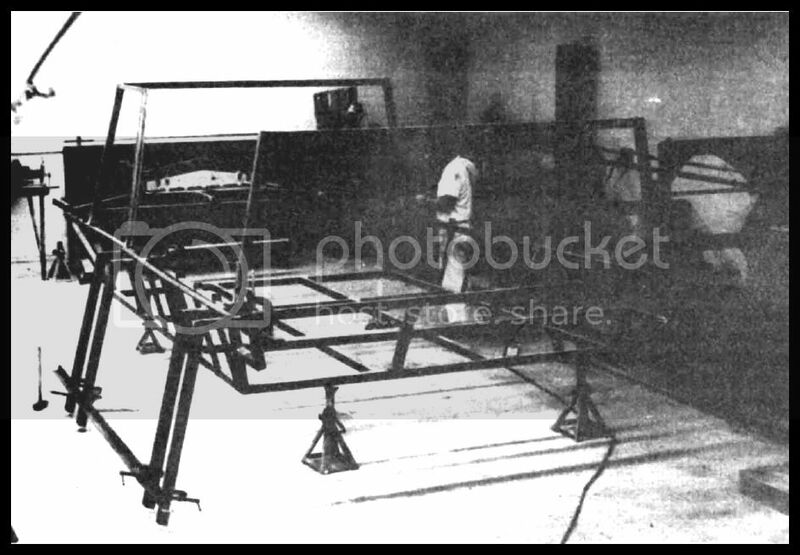 You have to remember that it was a prop – meant to be used on a soundstage and then discarded. It wasn’t built to withstand California sandstorms and Ohio winters. The guys did the best they could with it under difficult conditions but God only knows what has happened to it in the last 13 years. 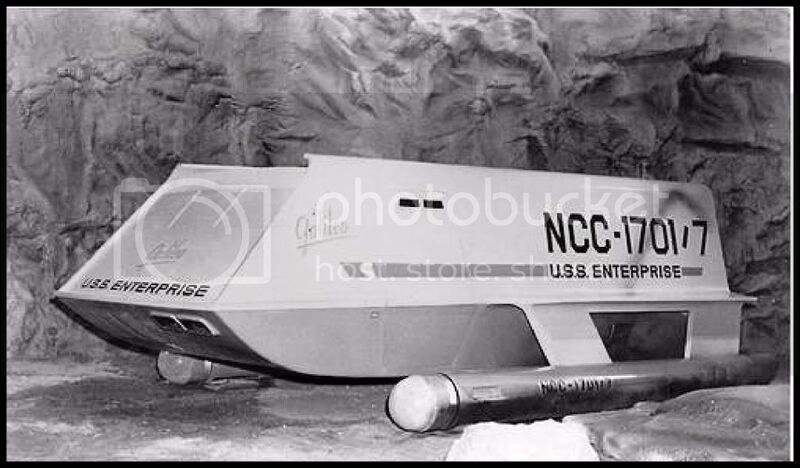 I know how much such an iconic piece of Trek history means to many out there, but actually owning this white elephant, if it exists, would be a huge, major undertaking – a veritable money pit, if you will. Sorry about rambling on so much, but I get a bit touchy when someone disses the’ol Lagrange (not to be confused with the ‘current’ Lagrange). 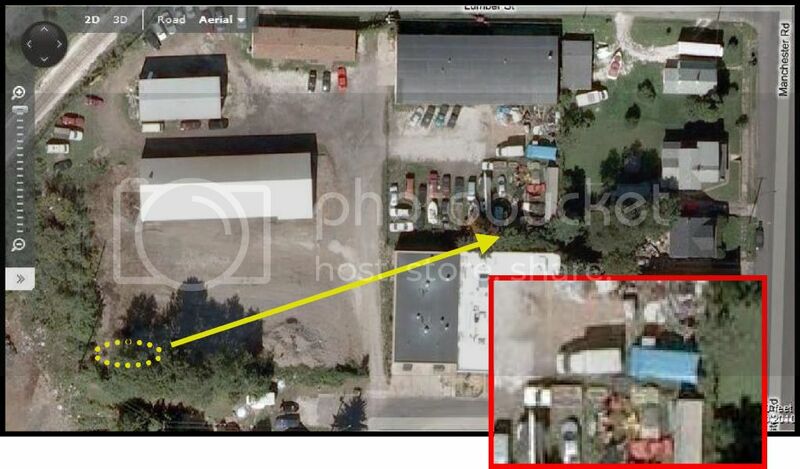 This appears to be a more recent view of the yard. 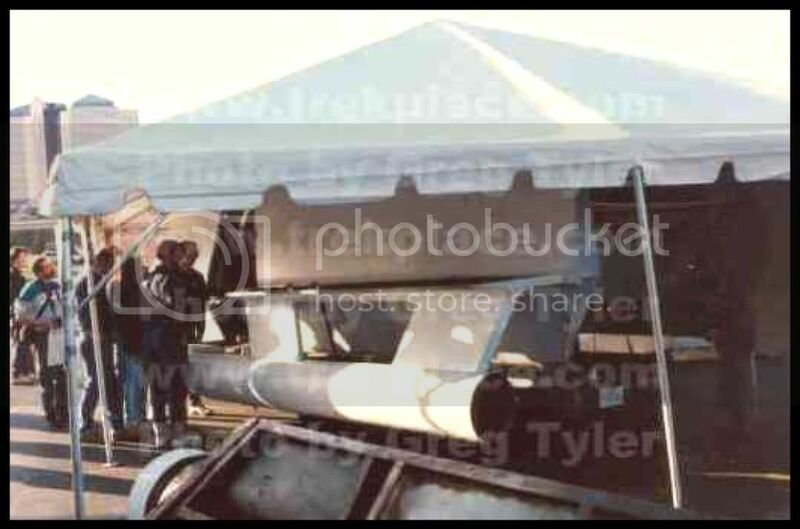 It shows the shuttle covered in a tarp in another location behind a truck! The yard where she was has been cleared. If this view is more recent then the “Google Earth” or “MS Virtual Earth” views, then it’s very possible the Galileo survives! Either the owner has her or someone else. There may still be “possibilities”! 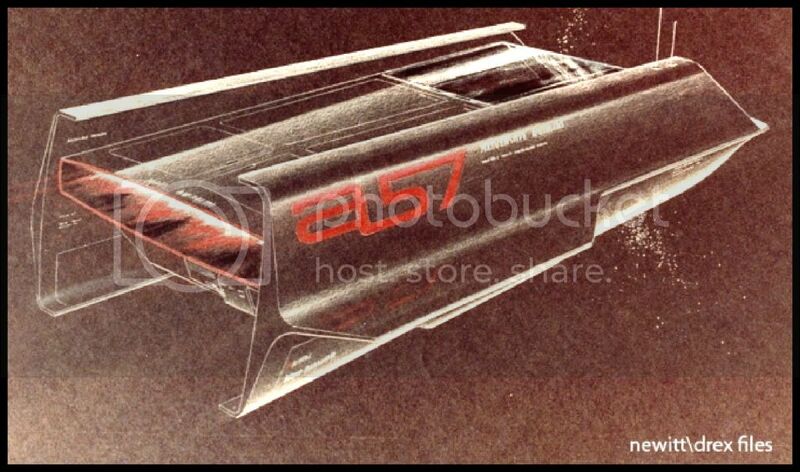 Thomas Kellogg shuttle drawing - "Forgotten Trek"
September 8, 1966…or “Stardate: 6609.8” if you will. A date that marks the television premiere of what would become an American icon in science fiction: “Star Trek”. So much of what came from that show is such a part of our society and of our planet, that’s it’s hard to imagine what things would be like if “Star Trek” had never been. The iconic starship “USS Enterprise” was the ship that took our imaginations on a great ride. And aboard each version of the Enterprise there have been shuttlecrafts; and of them, the equally iconic “Galileo NCC-1701/7”. 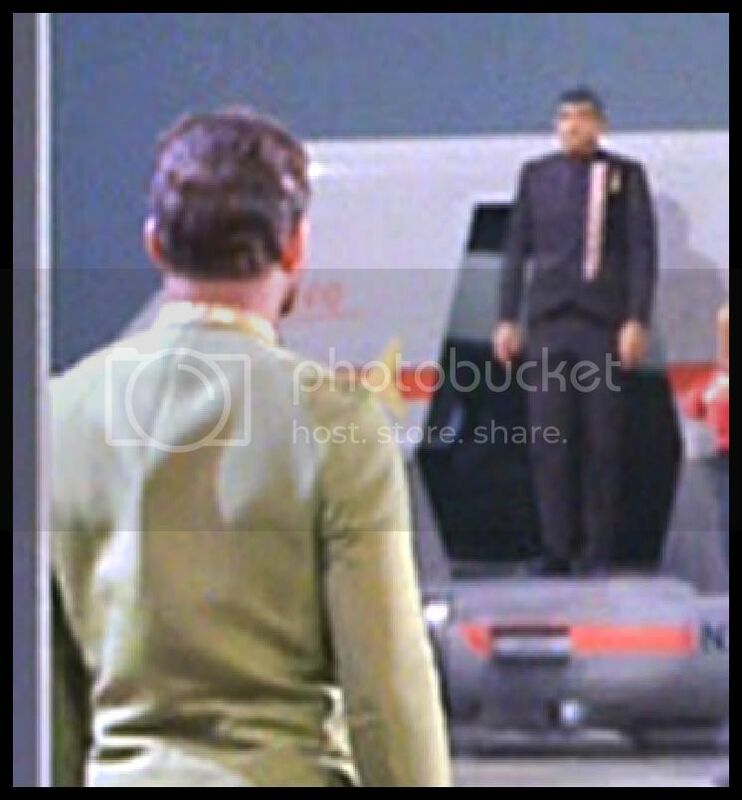 In episode #13 “The Conscience of the King”, Kirk takes Lenore Karidian to the observation corridor that overlooks the hangar deck and refers to the shuttles there. 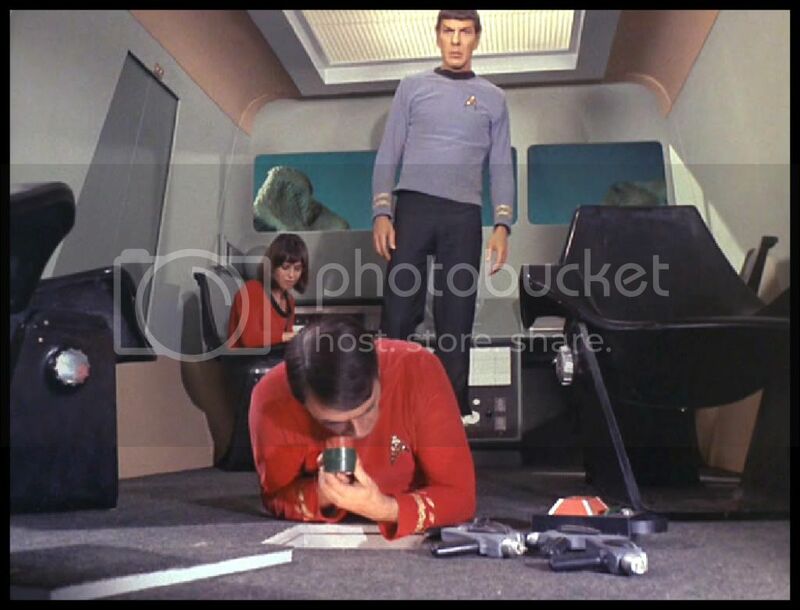 Episode #14 “The Galileo Seven”, finally revealed this previously unseen aspect of the Enterprise. 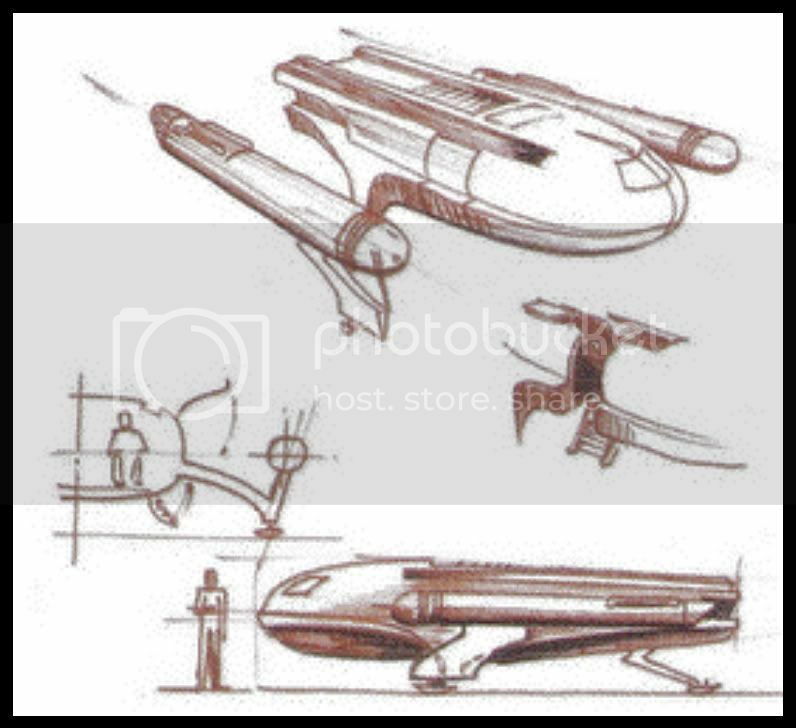 Production designer Walter “Matt” Jefferies, who designed the Enterprise, was asked to design a shuttlecraft. 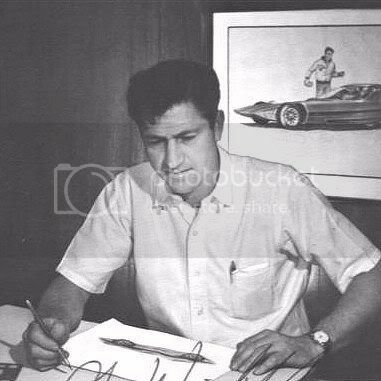 What he came up with was craft that was sleek, smooth and curved. 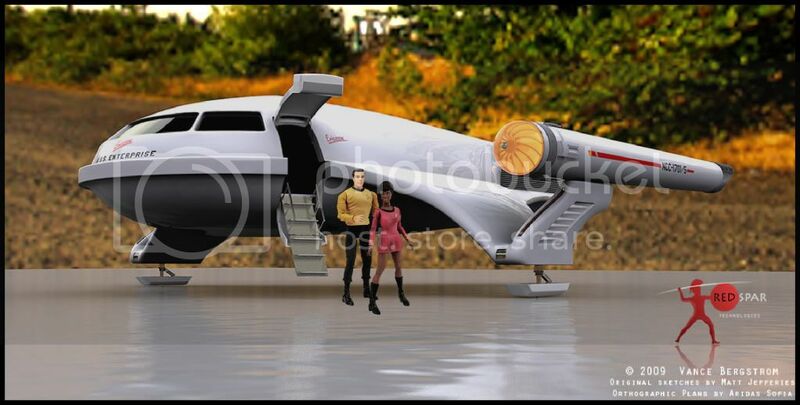 “We built the [Star Trek] shuttlecraft, full-size shuttlecraft that was two separate units,” Winfield said. “One would be a complete exterior, full size. 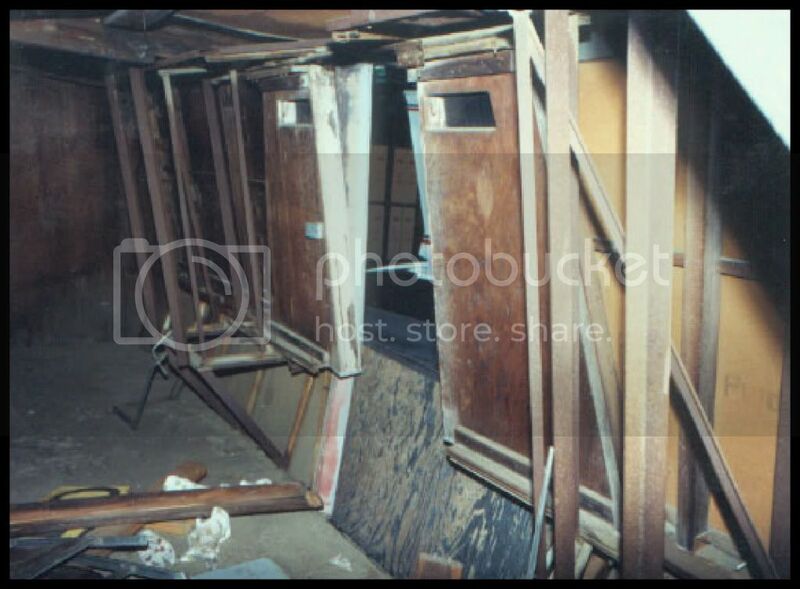 Then we built the complete interior. This interior had what we called ‘wild’ walls. What you do is you make the walls in four-foot sections on wheels so you can put up one wall and they could film the actors sitting on the seats and whatnot. 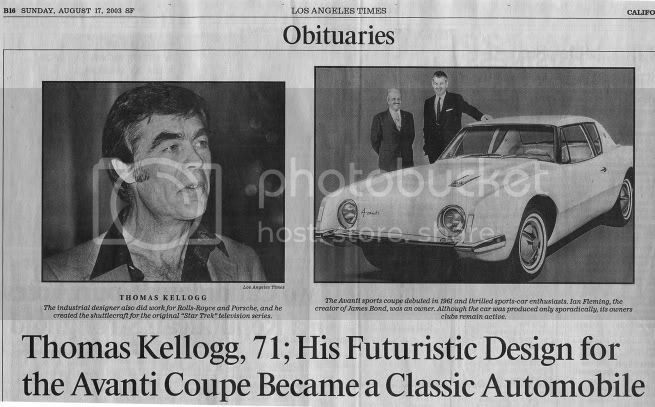 It should be noted that in an interview, Matt Jefferies says that Winfield designed the shuttle, but Thomas Kellogg’s obituary also states the he designed the shuttle. I believe it was a collaborative effort, with Jefferies “utility vehicle” selected as a base design by Kellogg, who was working under Winfield; and Jefferies putting the finishing touches on that design. Winfield’s department constructed the finished design. 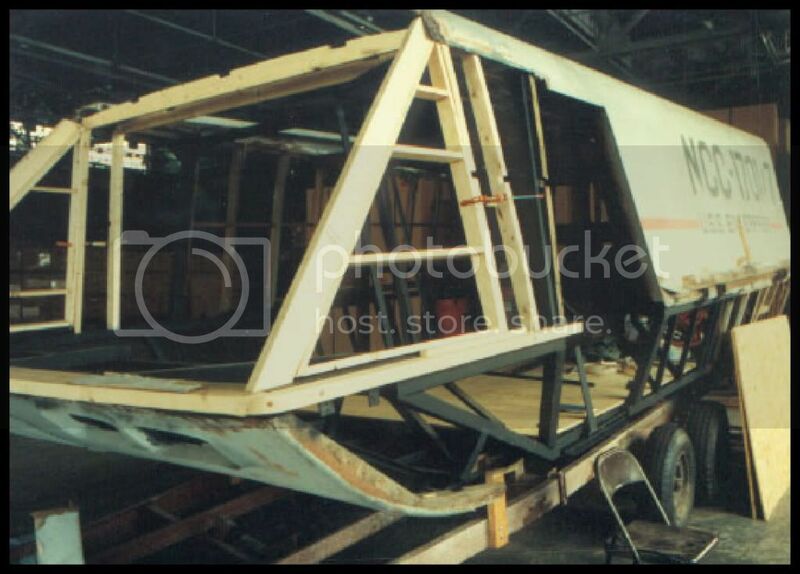 AMT’s offer to build the shuttle allowed the production to go ahead with “The Galileo Seven” episode. Here are pics of the Galileo under construction at AMT Phoenix.